Feeling good in our homes or offices isn’t just a matter of having a beautiful space: No matter how fabulous your furnishings, a poorly designed indoor environment can literally make you sick. Building green means considering not only the environmental impact of materials and construction, but also the physical and psychological health of the occupants. The next phase of our series covers Indoor Environmental Quality (IEQ)—one of the criteria of the USGBC‘s LEED rating system—and how you can achieve it in your own space. IEQ addresses the subtle issues that influence how we feel in a space. It’s not some airy-fairy concept; these are scientifically proven facts. 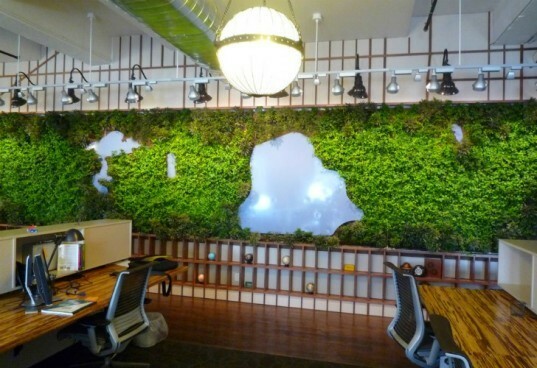 Companies that make the move to green buildings have employees with lower turnover rates, fewer sick days, and higher productivity, while schools demonstrate higher test scores, lower absenteeism and heightened academic enthusiasm among students. At home, of course, these factors are vital, since the way we feel at home affects every area of our lives. Some can argue that it is not only desirable, but also a fundamental human right to live and work in spaces with healthy indoor environments. Buildings enhance people’s lives when they permit ample air circulation, maintain clean air and comfortable temperatures, and allow individuals to have a sense of control over their own indoor experience. People generally experience a greater sense of well being when they can make easy adjustments to their immediate space, such as through operable windows, skylights and sliding doors. Particularly in shared spaces, like family homes and offices, it’s important to feel that the indoor environment can meet your own needs. Climate controls designed into multiple rooms can also promote comfort and conserve energy by allowing temperature changes only where needed. 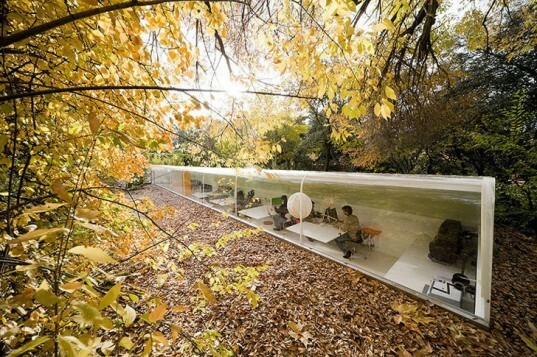 Studies show that employees are actually far more productive in an office space that permits awareness of outside conditions. Isn’t it nice to be able to look out on a tree or garden? Or better yet, to step out for a few minutes for mid-day stress reduction? Various parts of Europe are planning to enact “blue-green” laws, which will entitle all workers to a view of the sky and landscape. Perhaps policy makers in the States could boost the productivity of the American workforce by drawing from these ideas and others described in Towards Sustainable Architecture: European Directives and Building Design. 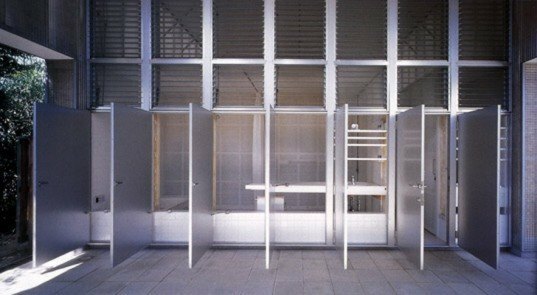 One of the greatest examples of promoting personal comfort in shared environments can be found in Shigeru Ban’s Naked House (2000), which “gives everyone freedom to have individual activities in a shared atmosphere.” The portable bedrooms sit atop castors, and can be rolled near air conditioning units on cold days or the heaters one cold ones. The house is lit by diffused natural light on all four sides and uses doors instead of windows to turn the bathroom (above) into a covered breezeway for natural ventilation and light. Ban’s “radical” design won Best House in the World at the World Architecture Awards. The building envelope can provide cross-ventilation through narrow floor plans and openings in floors and ceilings that allow vertical circulation. Solar chimneys and other types of stack ventilation draw heat up and move air even when there is no breeze outdoors. Spaces that are closed up like hermetically sealed boxes can cause pollutants to accumulate to levels that can pose health and comfort problems and contribute to Sick Building Syndrome. Instead, naturally ventilate spaces as much as possible without compromising reasonable humidity levels. Variations in temperature are also important—spaces kept at a constant temperature do not mimic our natural internal fluctuations, and can cause a sense of malaise. When using mechanical ventilation, make sure that the “exchange rate” is high, meaning that the majority of air in a space is coming from the outdoors, thereby reducing the amount of pollutants inside. Fan-powered ventilation is recommended to remove air from single rooms, such as bathrooms and kitchens, where the pollutant levels from human activity, cleaning agents and mold are high. Air handling systems use fans and ductwork to constantly remove indoor air and distribute filtered and conditioned air to strategic spaces throughout a building. 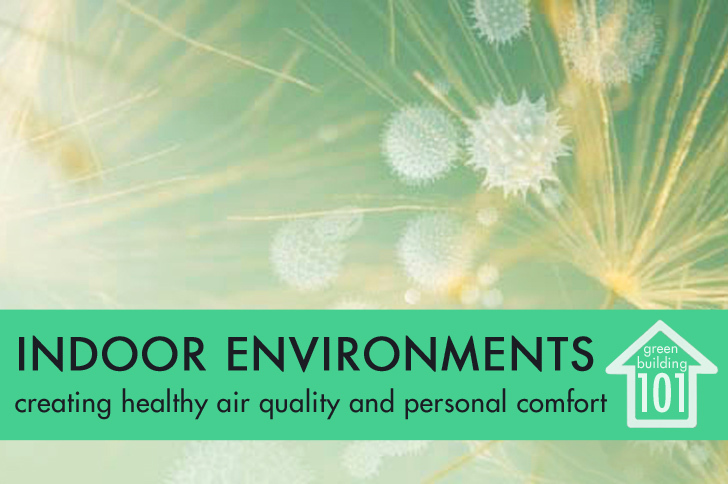 Identify potential sources of indoor pollution that stem from design choices, existing conditions, and lifestyle activities. Moving into a new home, remodeling a space, and bringing in new furniture can expose inhabitants to abnormally high levels of volatile organic compounds (VOCs), which are the toxic gases, such as formaldehyde, released from everyday materials that are responsible for contributing to cancer, asthma, fatigue, and other ailments. Formaldehyde is found in household products and fuel-burning appliances, “permanent-press” clothing and draperies, and many paints, coatings and glues. The most significant source is pressed wood products for cabinetry, furniture, and subflooring. A smart designer will specify paints, adhesives, sealants, furniture, wood sealants and other products with a low or no VOC content to help ensure the health of the occupants. Our last segment on green indoor building/decorating supplies provided myriad examples of materials and resources to help create a healthy environment. 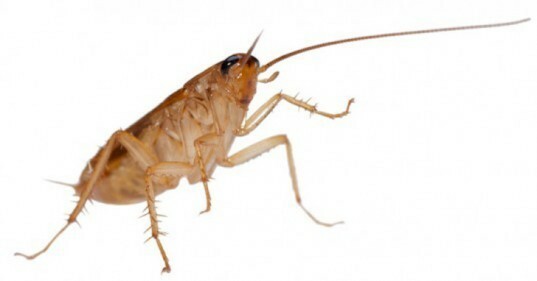 Use non-chemical methods of pest control when possible. If the roach won’t take to being led outside with a nudge from a newspaper, then be sure to ventilate the space well after using a pesticide. Natural pesticides have fewer harmful side effects and break down more quickly in the environment than synthetic chemicals do. Don’t forget that they are still poisons and harmful to humans. Try Poison-Free Ant & Roach Killer, which uses food-grade mint oil to kill bugs in seconds. It’s also a good habit to frequently wash indoor plants and pets, which attract bugs indoors. To control pollution already existing in a house, test basements for radon, and other spaces throughout for excessive dampness and mold. Prevent mold growth, which also contributes to asthma, fatigue, and other ailments, by preventing the accumulation of water at drainage systems and at areas where mechanical ventilation condensates. Also inspect the house for leaky pipes, windows, skylights and other areas to eradicate problems from mold. The Environmental Protection Agency’s website contains strategies for improving the quality of indoor air in your home. I'd like to begin providing standard tests to evaluate the IEQ of my clients home. Do you have any resources or ideas that could help in my endeavors to stand apart from my competition while making clients more aware of their Indoor Environment? Thanks for the article, are there any other links for further research? Really Good one and very informatic. airqualitytest.ca is what I use to test the quality of the air inside my home. really easy. great site. Interested Parties, What is your experience with comprehensive monitoring for the ID and quantification of chemical, biological, radiological and physical insults as a routine technique to assure good health in homes, schools and workplaces? This would ID toxic sources from totalitarian societies that sell us $ billions, before illness occurres. "How to Grow Fresh Air: 50 House Plants that Purify Your Home or Office (Paperback)" by B. C. Wolverton lists plants and the quantities of pollutants they remove. Some plants like Boston Fern are great for removing formaldehydes, other plants, like Sansevieria - snake plant / mother in law's tongue - give off more oxygen at night making them great for a bedroom - they are also almost impossible to kill! You mentioned several times about the scientific factuality of the personal impacts of indoor environmental quality. Are these studies online? Could you link to some of them? Thanks. Andrew- we used Safecoat on a house in Houston to seal away VOC's; the molecular structure of their primer is super tight and, according to their literature, prevents off-gassing from paints underneath. "Studies show that employees are actually far more productive in an office space that permits awareness of outside conditions. Isn’t it nice to be able to look out on a tree or garden — or better yet to step out for a few minutes for mid-day stress reduction?" This is incredibly true. I used to work for a publishing company, the office of which is located in the basement of a mall, and the fumes from the food court would linger inside our office for hours. Everyone would joke about how we have no idea what's happening outside anymore, and not having any windows at all especially depressed me. These are all fantastic! As I began pondering the 4 aspects mentioned above, I wondered what costs are associated with implementing them? Especially after the critical article in the LA Times today on Steve Glenn and Ray Kappe's Living Homes architecture: Criticism of "Green" Prefabs I think these are defintely wise things to invest in, but it would be interesting to get an idea on funds required. Is the Green Building 101 forum a proper place to address this? Another great article in the series. The skylight illustration caught my eye. Perhaps it can work in San Francisco, but in many parts of the country isn't this a very un-eco thing? 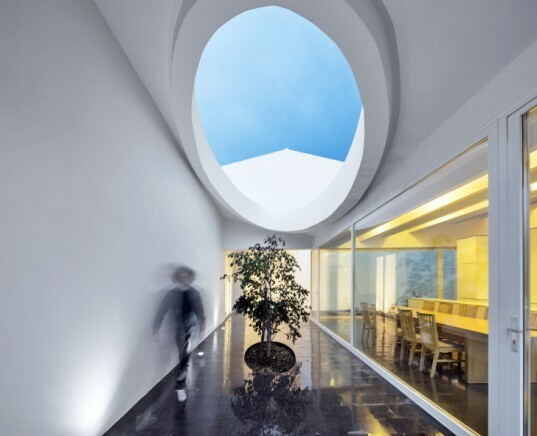 Skylights, particularly horizontal ones, contribute most of their heat and light in the Summer adding to the cooling load, while in the Winter they present an excellent means of losing heat to the atmosphere. To Andrew above and his question about improving existing home air quality, Spider plants are supposed to be quite good. See http://edis.ifas.ufl.edu/HE356. Or for a mechanical sollution see EcoQuest at www.ecoquestintl.com. Their Fresh Air, based on the excellent RFG (www.rgf.com) technology which helped combat SARs, removes all kinds of pollutants very effectively. In regards to #3 in particular, how can we improve the air quality of an existing home? Are there any proven, sustainable strategies for removing VOCs and other pollutants (besides simple ventilation), such as EPA air purifiers or possibly adding special indoor plants? Feeling good in our homes or offices isn't just a matter of having a beautiful space: No matter how fabulous your furnishings, a poorly designed indoor environment can literally make you sick. 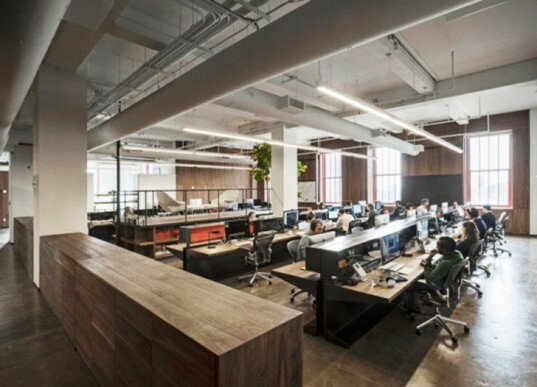 Building green means considering not only the environmental impact of materials and construction, but also the physical and psychological health of the occupants. The next phase of our series covers Indoor Environmental Quality (IEQ)—one of the criteria of the USGBC's LEED rating system—and how you can achieve it in your own space.